8 5/8 by 11 1/8 in. Although best known for his portraits and historical and religious subjects, Bonnat’s landscapes and Orientalist scenes are among his most intensely personal and instructive works. The artist’s journey to the Middle East in 1868 with a party that included Jean-Léon Gérôme (1824-1904) – Bonnat’s only expedition to the region – would have a profound impact, both in terms of technical and formal innovations and an inspired approach to the realistic portrayal of modern daily life, including his own. 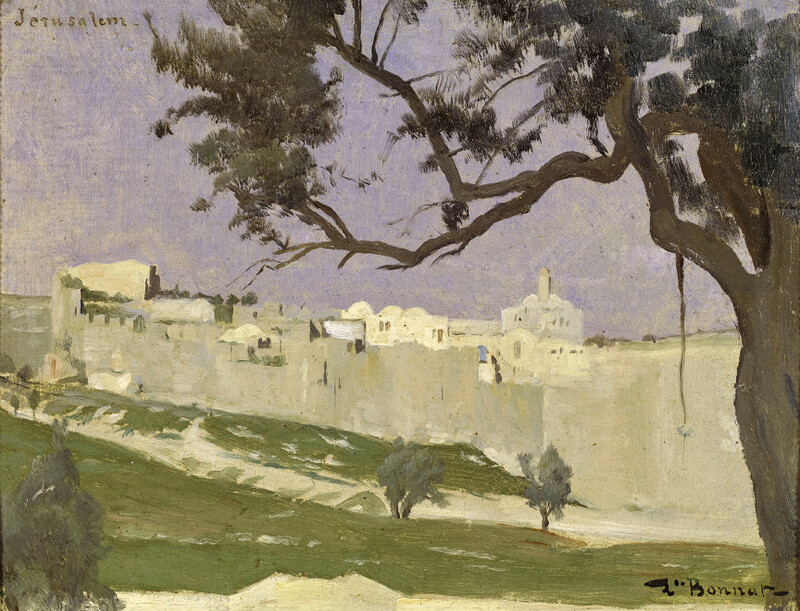 In the present work, one of approximately 72 small oil sketches made during the course of his travels, the biographical element is subtle but clear: with his signature bravura and eye for elemental detail, the artist records the impressions and the specifics of his arrival at the gates of Jerusalem in April of that year. In March, the group was still in Egypt, and, after a period of intense artistic activity in and around Cairo, set off through the Sinai in a long caravan comprised of nearly 50 camels, 20 camel-drivers, a dragoman (Joseph Moussali), a cook (Ahmed), his helper (Geheir), and two Egyptian servants. By the third of April, the group had arrived at the gates of Jerusalem, where they remained overnight, awestruck by the beauty and drama of the scene. “The first glimpse of Jerusalem was gripping,” Testas penned, “the sun-illuminated city was silhouetted against a violet thundery light, while the outlying land lay under the shadow of clouds,” (Willem de Famars Testas, De Schilderskaravaan 1868, Leiden, 1992, p. 115). Four days later, they climbed up the eastern flank of the Mount of Olives, and visited the Chapel of the Ascension. From this vantage point, the travelers were again “blessed with a fantastic view of Jerusalem […],” (Testas, p. 120). This panorama was already well known to artists, as well as to contemporary photographers such as Wilhelm von Herford (1813-1866), Francis Frith (1822-1898), Auguste Salzmann (1824-1872), Felix Bonfils (1831-1885), and Frank Mason Good (1839-1928). Goupil also made photographic studies of the site, which he shared with his colleagues and which may have served as models for several of the artists’ later works. (A few years earlier, Gérôme had painted his own panoramic portrait of the city, this time from an elevated viewpoint from the west. This study would become the inspiration for his remarkable Jérusalem [Golgotha] of 1867 [Musée d’Orsay, Paris].) Two of Bonnat’s oil sketches, that presented here and a slightly larger work, (9 x 12 ¼ in. [22.9 x 31 cm. ]), now in the collection of the Musée Francisque Mandet in Riom, recall these panoramic photographs, though the sweeping swathes of thick paint and vibrant energy of the scenes suggest that they were recorded on the spot. Bonnat’s experimentation with landscapes painted en plein air had begun a decade earlier, during another expedition abroad. In 1857, the same year that he made his Salon debut, the artist had embarked on a three-year period of study in Italy, funded by his native city of Bayonne. Sketches from this time reveal a new interest in atmospheric effects - Bonnat was at this moment reputedly “in love with sunshine and the picturesque” – and a return to his early artistic education. Raised in Spain, Bonnat had studied at the Prado, where he was influenced by both the intense realism and the painterly traditions of Spanish Baroque art. Later studies (1854-7) with the French history and portrait painter Léon Cogniet (1794-1880) in Paris, famous for his looser, less rigorous academic style, allowed Bonnat to further develop his idiosyncratic technique: vigorous brushstrokes, impastoed surfaces (one contemporary critic even likened Bonnat’s brush to a sculptor’s tool), and extensive use of chiaroscuro marked the artist’s canvases, giving them a sense of immediacy antithetical to most academic art. In Jerusalem, Bonnat’s distinctive style has been perfected through the seamless merging of these two artistic approaches. Thickly applied paint gives weight and volume to the architecture here portrayed – indeed, Bonnat’s landscapes are often as molded and shaped as the figurative works he would later create – while rapid-fire brushstrokes animate the surface of the painting, barely able, it seems, to hold fast this moment in time. Despite contemporaries’ appreciation of these compelling landscape views, and the patronage of several leading American collectors, including William H. Stewart (1820-1897) and Catherine Lorillard Wolfe (1828-1887), Bonnat would cease to exhibit his Middle Eastern pictures after 1876. By 1882, besieged with the portrait commissions that would make him rich, he abandoned them altogether. Jerusalem, then, as one of a series of deeply autobiographical paintings created during Bonnat’s short-lived foray into Orientalism, and as an exemplar of his technical skill, must stand as one of the artist’s most prized and poignant works. Of the artist’s departure for the East, one contemporary mused, “. . . et, après une excursion glorieuse dans la peinture historique, le voilà en route pour son tour d'Orient. Il s'est hissé sur la bosse de son dromadaire et chemine avec la caravane,” (Alix Laincel, Les peintres de la femme, Paris, 1888, p. 65). This number is confirmed by Achille Fouquier in his monograph and catalogue raisonné (see L. Bonnat: première partie de sa vie et de ses œuvres, Paris, 1879). Bonnat executed a series of watercolors during this trip as well. The impetus for the journey may have been the opening of the Suez Canal, a source of intense interest and excitement in Europe at the time. For Bonnat in particular, this event would have had special meaning – Ferdinand de Lesseps (1805-1894), a diplomat and the administrator in charge of the Canal’s construction, was a fellow Bayonnais and well known to the Bonnat family; indeed, the artist would be asked to paint de Lesseps’s portrait in 1879. On 12 April, Gérôme would leave the group and depart for Marseilles; Bonnat then became the ostensible head of the expedition. Lenoir’s book, Le Fayoum, le Sinaï et Pétra: Expédition dans la Moyenne Égypte et l'Arabie Pétrée (Paris, 1872), was illustrated by Gérôme. In 1993, the Tel Aviv Museum organized an exhibition dedicated to the 1868 journey, based largely on Testas’s detailed diary (see Willem de Famars Testas, De Schilderskaravaan, 1868, Leiden, 1992.) (Bonnat was represented by a series of landscapes of the Sinai, Aqaba, Jerusalem, Jericho, and Syria.) Though Gerald Ackerman has referenced a pair of “lively but unpublished” letters written by Bonnat about his stay in Jerusalem, these have not been located (Jean-Léon-Gérôme: His Life, His Work, 1824-1904, Paris, 1997, p. 80). Goupil’s photographs are mentioned in Lenoir’s book (see above), and were for decades believed lost or destroyed. In 1996, an album of 77 albumen photographs surfaced, owned by one of the 1868 expedition’s participants, Ernest Journault. It was then determined that Goupil had presented each member of the party with a similar album, designed for private use. Most of the photographs are amateur in nature, and appear to have been made in consultation with the painters. The most common subjects are landscapes and figure groups, and echo the works of both Gérôme and Bonnat. The album is today in the possession of the Bibliothèque Nationale de France. Coincidentally, the American landscape painter Frederic Edwin Church (1826-1900) was in Jerusalem at the time of their arrival, and exchanged stories of travel with the group. Church’s pictures from this period – and particularly his panoramic city views - provide an intriguing point of comparison with Bonnat’s own (cf. Jerusalem from the Mount of Olives, March 1868, 1868, brush and oil, pen and black ink, graphite on paperboard, 12 ⅞ x 20 ⅛ in. [32.7 x 51 cm. ], Cooper-Hewitt Museum). Testas wrote for a third time in his diary about his sight of Jerusalem, when the group returned to the city on 16 April: “. . . peu après Béthanie on débouchait en face de Jérusalem. La ville se présente très bien ce côté: on voit les murailles imposantes et, derrière ells, la grande mosque d’Omar, et, enfin, toute la ville qui s’élève en pente,” (p. 54). Some of Goupil’s photographs became models for wood engravings illustrating the 1872 travel account of Paul Lenoir. Perhaps in recognition of Bonnat’s own reliance on this medium, the poet Jules Laforgue (1860-1887) dismissed him in 1886 as mere “producer of photographs” (“Souvenirs d’un Salon,” in Mireille Dottin, ed., Laforgue: textes de critique d’art, Lille, France, 1988, p. 122). During an earlier visit to Jerusalem, the artist had made his opinion of the city and its environs clear: “. . . the region is by no means commonplace, once seen it is never forgotten,” (Gerald Ackerman, “Jean-Léon Gérôme, à cinquante ans, dresse le bilan de sa proper carrier: son autobiographie, rédigée en 1874,” Bulletin de la Société d’Agriculture, Lettres, Sciences et Arts de la Haute Saone 14 , p. 15). The dimensions of this work are identical to a series of at least eight landscapes painted by Gérôme during the 1868 expedition. (These are now at Vesoul, in the Musée Georges Garret.) This may suggest that the artists were sharing a single source for their materials while they were abroad, or, perhaps, were borrowing each other’s canvases. The Musée Bonnat-Helleu in Bayonne, France has in its collection 10 paintings and a print related to Bonnat’s 1868 travels. Several of the oil sketches in this group are of similar dimensions to the present work, with one, Oued encaissé, painted on wood, being of nearly exactly the same dimensions. Also in the collection is an 1854 sketch of a seated Arab figure; this may indicate Bonnat’s interest in Orientalist subject matter far earlier in his career. René Ménard, The Portfolio, January 1875, p. 68. Bonnat would later write an article on one of the artists most influential to his career, Velázquez, in 1898; Léon Bonnat, “Velázquez,” Gazette des Beaux-Arts 19, no. 489, March 1898, pp. 177-82. C. H. Stranahan, A History of French Painting, New York, 1888, p. 413. This apparent repudiation of the academic tradition was not a statement of Bonnat’s modernism, however, or of his sympathies with “art for art’s sake” and the avant-garde: “I do not [paint in this manner] for the sake of painting thickly,” Bonnat felt compelled to explain, “but only because I get my effect better in that way,” (quoted in John C. Van Dyke, Modern French Masters, London, 1896, p. 49). In 1870, having won a gold medal at the previous Salon, Bonnat contributed two Orientalist works to great acclaim; these were the Femme fellah et son enfant (Metropolitan Museum of Art) and Une rue à Jérusalem (present location unknown). Bonnat’s sense of drama underscores the fleeting nature of the scene: the tree on the right reveals the city of Jerusalem as if a curtain has just parted on a theatrical stage. In 1872, the landscape portion of Bonnat’s Cheiks de l’Akabah, Arabie Pétrée (Hermitage Museum, St. Petersburg) was praised by the caricaturist Stop: “All those who know and love the East, all those who are horrified by our dull sky and our ailing sun will stop with pleasure before this pretty canvas,” (Stop, “Le Salon de 1872,” Le Journal Amusant, no. 822, June 1, 1872, p. 4). Stewart’s appreciation of Bonnat may have been due to his preference for Spanish art and artists.